The cast rocks and the heist is a blast. This movie's just plain cool. Ocean’s 8 is strapped with a cultural moment. It’s a female-driven movie in a period starved for them, and what’s more, it’s entering the frattiest, dude-heavy franchise in Hollywood. With that context, it would be wrong to ignore the “importance” of Ocean’s 8, but watching the movie, you almost forget that importance. This movie is effortless. It’s slick, cool and a total blast. It doesn’t shoulder its moment like a burden, it flaunts it like a cape. The Ocean’s franchise is a collection of heist movies. In the past, they’ve featured George Clooney cracking wise, Matt Damon doing his wonderful little half-grin and Brad Pitt eating lots of fast food and talking with his mouth full. They’re awesome. Ocean’s 8 is less a sequel to these movies and more of a spinoff, but it owes nothing to the flicks that came before, and hesitates to give them the barest nod. Sure, the heist formula is here, from assembling the crew to mapping out the plan to the final “here’s what you didn’t see” reveal, but these women take ownership over that process from start to finish. And wow, what a cast. Sandra Bullock and Cate Blanchett are your two masterminds (the former exudes savvy, and the latter has never, ever been cooler—Blanchett’s physical here, and her walk and posture and mannerisms are wholly magnetic), but they’re joined by a witty Mindy Kaling, a steady Sarah Paulson, a hilarious Awkwafina, a Rihanna who blessedly doesn’t try to do too much and a Helena Bonham-Carter who blessedly tries to do everything. Oh, and they’re all out to steal some diamonds from Anne Hathaway, who leans all the way into her undefinable hateability to deliver a truly cackle-worthy performance. There’s no weak link here. Given its timing with the women’s movement in Hollywood, and given its unfair alignment with past female-centric efforts like the recent Ghostbusters reboot, you might expect Ocean’s 8 to be explicit about its femininity, but the best thing about it is that it’s really not, and that colors the whole event with a graceful lack of concession. There’s nothing here that hammers you over the head with “remember we’re the women’s movie” messaging. It’s just easy about it. In one conversation, Blanchett asks Bullock if she wants to rope a male colleague into the heist. Bullock says no. Why not? Bullock shrugs. It’s a he. In place of that explicitness, Ocean’s 8 holds an implicit ease that translates on screen into something superbly confident. This movie just swaggers around. The actors strut from scene to scene, often to the tune of the movie’s banging, unabashed soundtrack, and they spit lines that make you grin like an accomplice. We’re doing this. It’s inclusive but not preachy about it. It’s celebratory, but not exaggerated about it. It’s fun, but it’s not trying too hard to be fun. This isn’t a basement party for the freshmen. It’s an afternoon backyard rager for the seniors. What’s better, all that ease fits inside a framework that’s completely natural for these characters. 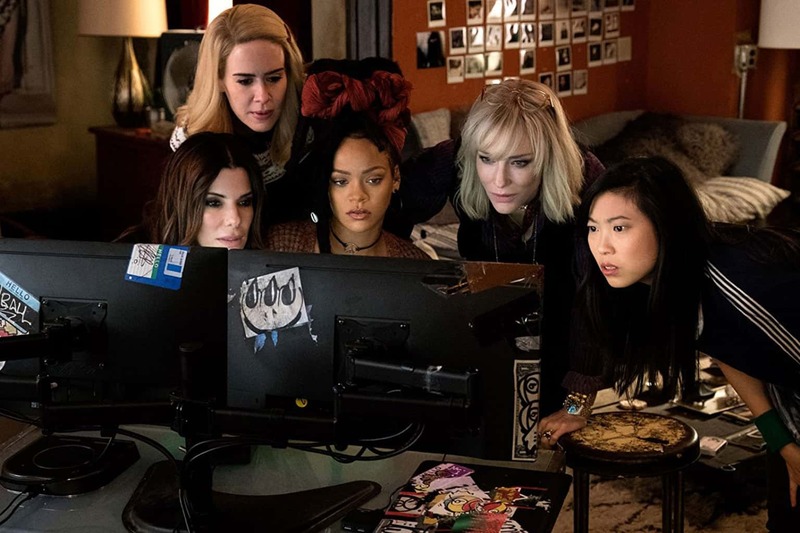 The main heist in Ocean’s 8 involves the MET Gala, an annual high point in fashion and celebrity. This might be traditional to say, but the MET Gala is something you would definitely consider to be more women-focused, so using it as a centerpiece in this movie feels strategic, but also a total no-brainer. This is a heist these women are well-suited—make that best-suited—to pull off. The Ocean’s guys would never touch the MET Gala. It’s not their lane. Here, it’s the perfect crime. And sure, Ocean’s 8 hiccups a bit. There’s a weird sort of fourth act in which James Corden crashes the party and spoils the vibe, and the overall scheme is maybe a bit less elaborate than what other Ocean’s movies have conditioned us to hope for (this job doesn’t lead to a giant set piece, though it does stitch together a tight, clever relay race between all the thieves’ various skill sets), but those qualms aren’t enough to diminish the sheer amount of satisfaction this movie has to offer. It’s just a great night out and money well spent, and it’s significant, too, that it doesn’t try—or need—to be anything more than that. Ocean’s 8 doesn’t draw attention to its casting or its implications, and that’s to its enormous credit. We’ve seen female-centered movies make bold, declarative statements from inside themselves—Wonder Woman’s battle scene across No Man’s Land is the most memorable—but that sort of scene makes sense for a movie like Wonder Woman (she already was an icon of the times, after all) and less so for Ocean’s 8. This movie didn’t need to be boldly feminist or overtly progressive; it already is those things without making a big show of it. That low-key vibe, for lack of a better word, means Ocean’s 8 sets a precedence for future movies of its nature to take a similar approach. Female-driven movies can just be movies. They can come with popcorn, and they don’t need an Oscar campaign to matter. Ocean’s 8 is a fun summer movie and its eight most important actors are women. That’s the whole story, and that story slays.